Compelling Conversations – Vietnam: Speaking Exercises for Vietnamese Learners of English is based on our original and highly successful English as a Second Language (ESL) textbook, Compelling Conversations. The difference is this unique textbook was created for Vietnamese English Language Learners. Like the original, this English as a Foreign Language (EFL) textbook includes thematic chapters to create quality conversations and uses conversation starters, interview questions, classic quotations, paraphrasing exercises, and traditional proverbs to create hours of English conversation and class discussions. This culturally sensitive text encourages students to speak about their experiences, their families, and their lives. With dozens of practical speaking exercises, Compelling Conversations helps advanced Vietnamese English Language Learners develop greater fluency, develop and express their opinions, give reasons to support their opinions, build critical thinking skills, prepare for standardized tests with speaking sections (TOEFL, IELTS), and create authentic conversations. Fluency also requires practice. Compelling Conversations encourages students to learn by doing and continually practice speaking English. As a result, students gain greater confidence, fluency, and vocabulary. They also create better conversations in English – in and beyond their English classes. Buy Compelling Conversations - Vietnam! 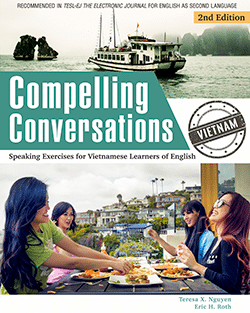 Discounted single copies of Compelling Conversations - Vietnam: Speaking Exercises for Vietnamese Learners of English are available directly from Chimayo Press with Paypal. Learn, work and dream in English with over 400 Vietnamese-English bilingual conversation questions. 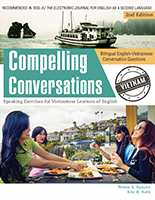 A bilingual companion to last year's second edition of Compelling Conversations – Vietnam, this ebook supplement provides easier access to conversational English for Vietnamese learners. Intended for American immigrants and intermediate Vietnamese English as a second language (ESL) students, these 420 conversation questions help learners share personal experiences and express opinions – in English and Vietnamese.